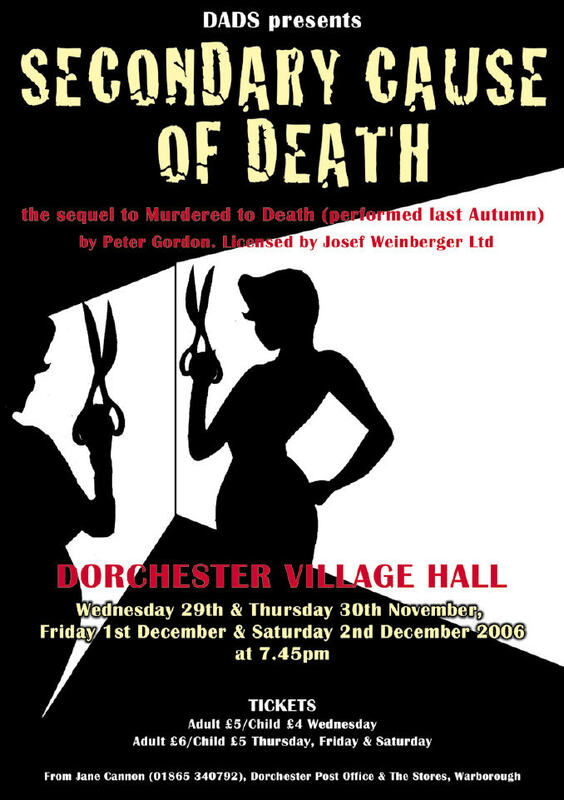 If you saw Murdered to Death, the November 2005 show, you will be used to a romp in pre-Second World War Surrey, with a group of comic characters and many deaths. In Secondary Cause of Death, some of the characters who survived death or prison return to produce yet more laughs. Colonel Craddock played by Terry Chipperfield now owns Bagshot House and continues to out-blimp Colonel Blimp . He enjoys the money, the house, the whiskey and the ministrations of his personal nurse, Nurse Parsley, played by Jane Cannon. If her novel treatments for gout are a success, her practice will grow at a very rapid rate. Unfortunately she is the second murder victim, so we never find out her sucess rate. But played by Jane many observers would like to try the treatment! The Colonel also enjoys the services of Ulster-born housekeeper Maria played by Debbie Claydon, who is the first murder victim. Her fate at the expense of a pair of scissors is short, but a nicely crafted cameo role (and special effect) nonetheless. The craft of the author in this series of plays is verbal humour and relentless word play, and the burden of delivering an unending stream of puns, malapropisms, and sheer incompetent detection falls again to Inspector Pratt played by Mark Williams. This is a demanding role mentally and physically, and Williams rises to the occaision with gratifying results. He raised laughs at a very satisfactory rate, and survives to tell the tale. With a final death count of five, that is no mean trick. This is no ordinary group of characters – of the rest, none are what they purport to be. The twists of the plot gives every other character a dual role. John Fitzgerald had the task of potraying a Polish Count who is really a German spy. Most actors find one foreign accent trying, but Fitzgerald had to battle with two. He remained most comfortable with the pedantic Polish Count, but the latent Nazi of the plot ranted to order with good effect. In Murdered to Death the real detection was performed by the Miss Marple copy, but in this play her sister is more an entrepreneur than an amateur sleuth. Played by Connie Macdonald, as an overbearing, greedy scheming hockey captain, she dominates the Colonel and most of the other characters. A welcome return to performance for DADS, Macdonald is at the centre of most of the killing. If Judy Dench has created M as the post-war face of agent control, then she is challenged by the ever reliable Sue Kitson who is the calm centre of pre-war counter espionage, but doubles as the Cook. Kitson has the task of countering the Nazi spy, feeding misinformation, and one feels that this is under perfect control. She also has the task of explaing the twists and turns of the plot to the audience, no slight task. 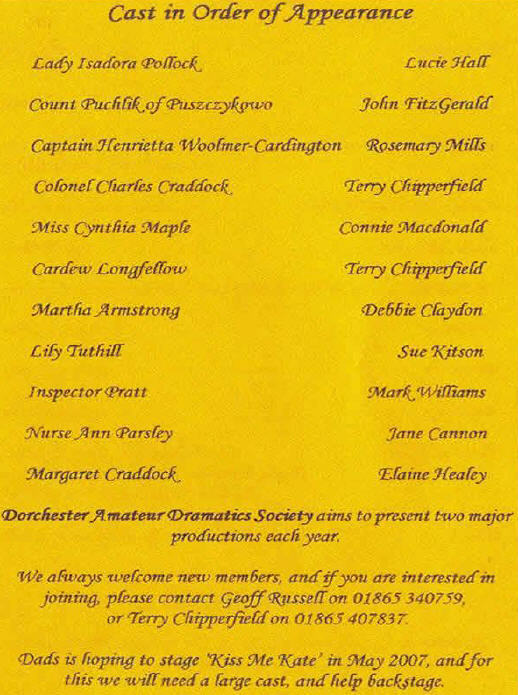 One of her agents is ATS Officer Capt Woolmer Cardington played by Rosemary Mills. She masters the public schoolgirl Capt, who is playing a talented double agent. The bumbling of Inspector Pratt causes her death by exploding teapot. If you have followed the plot so far then the idea that a widow of a First World War soldier can masquerade as a titled lady guest, upon release from a mental hospital who tries to assasinate the Colonel, might stretch your credulity a little. Played by Lucie Hall, Lady Isadora is believable, and a revelation. This was Hall’s acting debut, and an accomplished performance. The humour of the piece is further extended by the ploy of a double of the Colonel, an out-of-work actor Longfellow who is also not quite all he seems. Also played by Terry Chipperfield, he has no trouble at providing a lookalike, but the role requires a difficult need to have two voices, yet remain a convincing double. Chipperfield carries it off well, and a coup de theatre where Longfellow dies on stage in sight of the audience and the Colonel appears three lines later from the other side of the set, raised a few questions in the interval for the rest of the audience. The Colonel’s wife played by Elaine Healey escapes the mental hospital and adds to the death count on the last line. DADS is noted for convincing and lovingly crafted sets. The 1930s country house set was warm, and inviting and almost tremor proof. Designed by Michael Herbert and Colin Newton, with the decoration designed by Adrian Brooks it continues this tradition. 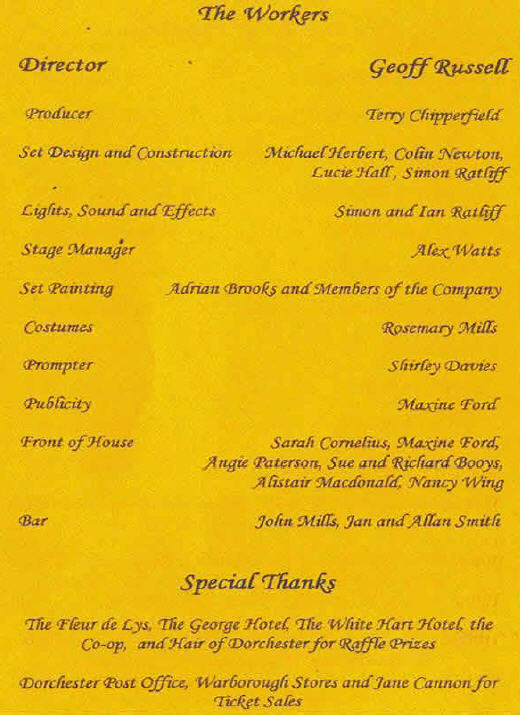 The play had lighing designed by Simon Ratliffe, and the explosions and smoke content provided him with opportunities to shine, which he did. Beware, the author has kept Inspector Pratt alive and a sequel is reported to have been written. The play was directed by Geoff Russell with success.